After I posted “how to make a Wall-E sandwich” on December 21, I started getting a lot of traffic to my blog, my flickr and my boyfriend’s flickr. At the time, I was still writing about my older bento on my blog and using my flickr to post pictures for my blog, so I decided to make a bento for people who were visiting my boyfriend’s flickr blog to see my latest bento. My boyfriend and I were on a vacation this day, but it was a Christmas eve, and I wanted to make something special. Which character did I pick? 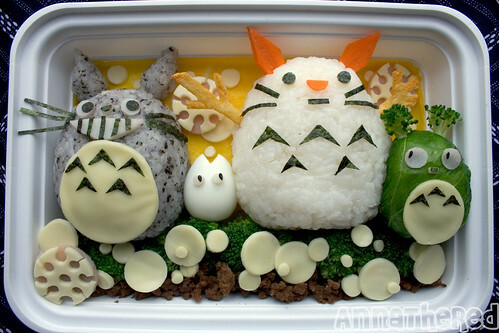 I wanted to make a winter themed bento, so I made Totoro, medium-Totoro and mini-Totoro making a Totoro snowman! I’ve made Totoro with rice and mini-Totoro before, but I’ve never made medium-Totoro before because he was blue… But since this was a special occasion, I really wanted to make all three Totoros. So I gave up trying to make medium-Totoro in blue, and made it in green (with lettuce). To let it snow in my bento, I made an egg sheet (see “how to make an egg sheet”) and put it in a bento box so snow would stand up. I put soboro (ground beef cooked with soy sauce and sugar) at the bottom of the bento box to for ground, and broccoli over it. 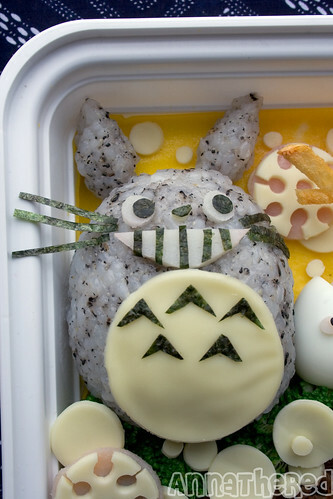 Then I made Totoro out of rice with black sesame seeds and cheese. (see “how to make Totoro”) I used kamaboko (fish cake) and seaweed for his eyes and mouth, and cheese for his stomach instead of rice for this one, because this Totoro was a lot smaller than the other Totoro I made with rice. 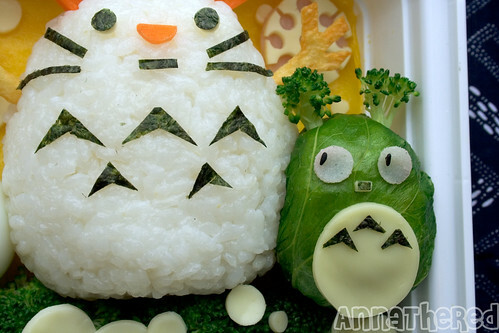 I made snowman Totoro with rice, seaweed and carrot. For its arms I cut a potato and fried it. I made mini-Totoro with a quail egg, seaweed and kamaboko as usual. 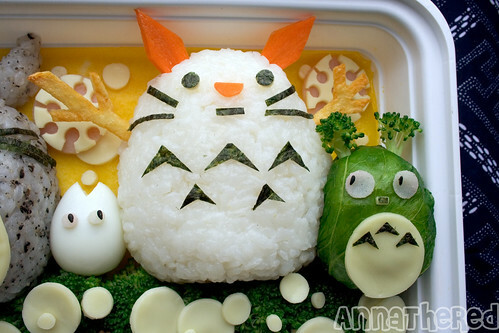 (see “how to make mini-Totoro”) Then I shaped potato salad I had made the night before into a ball, wrapped it with a microwaved lettuce leaf, and stuck small pieces of broccoli on as his ears. Lastly I put cheese and seaweed for its stomach and mouth, kamaboko and black sesame seed for its eyes. Every time you make blue totoro green, I want to suggest trying to make it purple, with beet juice or blueberries or something. Does that sound like a horrible-tasting idea to you? Your bentos are so brilliant. Thanks for sharing! Adorable! 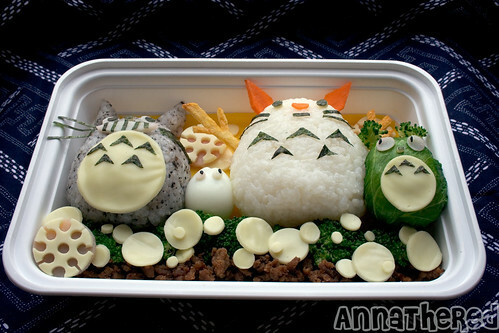 I look forward to seeing more of your cool bento! Use food dye to make blue!! !